You don't have to talk your kids into a visit to a theme park! A theme play park (or fun park) is an amusement park built around a fun theme. Common themes include water parks, adventure parks and some theme parks are based around movie studios. Theme parks are very popular kids' activities attractions in New Zealand. A few tips given by a mum to other mums on how to keep your kids safe at a theme park. May be of great importance! Listen carefully! Is a theme park for your kids? As well as being a fun family activity, many theme parks actually have an educational element. Some parks are based around physical activity, such as water parks, and these can provide a great opportunity for the whole family to get some exercise and fresh air. The main benefit for kids visiting theme parks is fun and entertainment. Most of them have a number of rides suited to different ages and some may even offer additional games and activities for kids. Most themed play parks have a selection of rides that are suitable for very young toddlers and children (although they may not be suitable for babies) with more thrilling rides aimed at older children and adults. Adventure type theme parks are best suited to bolder children who are not easily frightened. Most parks have catering and toilet facilities and souvenir or toy shops. Get ready to have a themed day of fun with your kids! Most major cities have at least one theme park, but the Rainbow's End is currently the largest theme park in the country. Admission to large theme parks can be expensive, but discounts may be available for families or season ticket holders. Getting there out of season could be an option if you want to pay less, but may not always be the best idea because of the weather. Often pre-booking tickets online can get you a discount of around 10%. They can get very busy during school holidays. It is best to arrive early to avoid long queues for rides. You'd rather try to get there on weekends rather than school holidays. 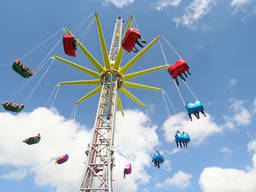 Most theme parks in New Zealand are open all year round although some may be closed on Christmas Day and Easter Sunday. It is advisable to check first if you are planning to go on a public holiday to avoid disappointment.